After a three-month hiatus of traveling through Southeast Asia, I returned to Almaty with big plans. With my partner, I'll be opening my own school, called California Academy, and we hope to expand the Walking Almaty empire a bit as well. We sought out a headquarters for our new operation, and we ended up in a neighborhood that I'd always been curious about, a part of town with a distinct feel but without a distinct identity. If you ask a local resident of the region bound by Rozybakieva, Abaya, Seifullina and Gogolya where exactly they live, they'll give you an intersection or a local landmark, or they might cite the municipal district, Almalinsky. Yet Almalinsky extends all the way into the so-called "Golden Quarter" of town to the east, and besides, the borders drawn by city hall have traditionally been paid little regard by Almatians. What we're left with is a chunk of town without an identity, one I can only give the uninspiring label "West Almalinsky." Unlike the eastern part of Almalinsky, with its wide streets, coffeehouses and Stalinki, West Almalinsky is tight, cozy, family-oriented and residential, with perhaps the city's largest variety of mnogoetazhki [многоэтажки; high-rise building blocks]. There are pockets here and there of charming two-story brick buildings, but most of this patch on the map is filled with long, densely-populated apartment blocks, like the famous mikry [микры; microdistricts] at Almaty's western edge, but without their notoriety or sense of civic cohesion. On a long walk here the day after we got the keys to our new office, I was struck by West Almalinsky's unique place in the urban grid: peaceful but not peripheral, with a calming, tree-bordered ambience. Nearly every apartment block featured a pensioner peering out their loggia, observing life without a hurry, and I was all too happy to adopt the local pace. My next walk here was more manic, as I was joined by a walking partner, the incredibly well-informed Ansarbek Kadraliyev. Bek wrote me response after detailed response on my Unsolved Mysteries page, answering so many of my questions that I was compelled to get in touch and invite him for a stroll. It turns out that he was the perfect company for picking apart the architecture and infrastructure of my new neighborhood. With a background in environmental safety and construction regulations, he had an insider's answer for everything I could throw his way. Why do so many roofs have dormers? (Because they're used to ventilate the attics). 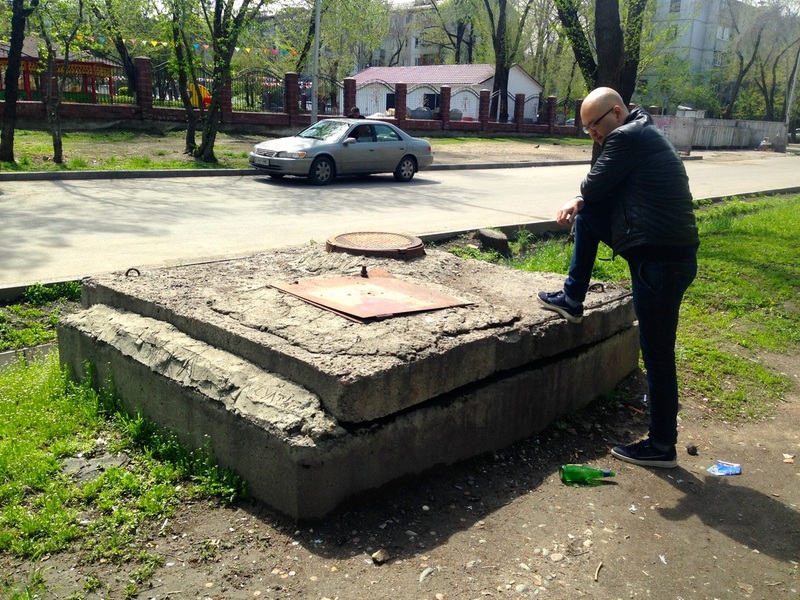 What's the deal with that elevated manhole? (It leads to a warm chamber for heating pipes called a teplushka, where homeless people crawl in to live during the winter). Why does Almaty have so many electrical transformers? (An entire fascinating lesson in civic engineering). Just because of this one factoid-filled walk, I'll be updating Walking Almaty entries for weeks to come. Walking with Bek through West Almalinsky, it became clear that it was a region direly in need of a civic reawakening. For every cynical complaint we shared, about reckless access ramps or garish alucobond, there was a streetscape feature that stopped us in our tracks: spunkily-painted schools, limestone municipal buildings with tasteful redesigns, quaint old kiosks with handpainted signs. Perhaps the lack of a name, in this way, was a barrier to the neighborhood's success. In the biggest cities in the States, newly-minted neighborhood names give community members an identity to rally around, a strictly-defined space citizens can feel like they bear collective responsibility for. Unless West Almalinsky takes on a name, mine or otherwise, it may remain vague and easy to ignore, even to the people who live and work there and want only the best.